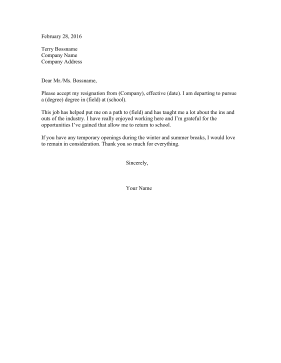 Leave a summer job for school with this printable resignation letter. Please accept my resignation from (Company), effective (date). I am departing to pursue a (degree) degree in (field) at (school). This job has helped put me on a path to (field) and has taught me a lot about the ins and outs of the industry. I have really enjoyed working here and I'm grateful for the opportunities I've gained that allow me to return to school. If you have any temporary openings during the winter and summer breaks, I would love to remain in consideration. Thank you so much for everything.